This news follows yesterday's leaked video of the Moto X4, which revealed that 2017's resurrection of the X line would feature a Snapdragon 660, a sizable 3800mAh battery, and IP68 water resistance. In fact, this shot appears to be from the same exact angle that the video was taken at, meaning that it could come from the same source. The lineup starts off with the Moto C and C Plus, which represent 'Unlimited Essentials.' The C will come with a 5.0" 480p display and 4G (presumably, as 3G wouldn't be anything to brag about), and the C Plus will have a 5.0" 720p display and a 4000mAh battery. Interestingly, the C Plus doesn't appear to have a larger screen than the standard C.
It then moves up to the E line ('Unlimited Value') with the E and E Plus. The E sports a 5.0" 720p screen, 2.5D curved glass, and a fingerprint sensor (a first for the E line). The E Plus will have a 5.5" 720p unit, as well as a massive 5000mAh battery. It's fair to assume that the Plus will also have that 2.5D glass and fingerprint sensor on board. Then, there's the X4 that we saw yesterday. Moto is tagging this one as "Unlimited Perfection.' It'll have a 5.2" 1080p display (not a 5.5-incher, as previously reported) and the aforementioned curved edges and 'SmartCam.' Here comes another branding rant: the phone is being referred to as the 'x' here, even though it's officially called 'moto x⁴' and will always be referred to as 'Moto X4.' Get it together, Motorola. Lastly, the Z line ('Unlimited Capabilities') will feature the Z Play and the Z Force. The Z Play should have a 5.5" 1080p display (same as the current Z Play's) and Moto Mods support, while the Z Force has ShatterShield (shatterproof plastic screen), Moto Mods support, and gigabit LTE. That last note means that the Force will have the Snapdragon 835 or better, as it's the only chipset currently that has the X20 modem. So... yeah. There's Motorola's entire 2017 lineup. 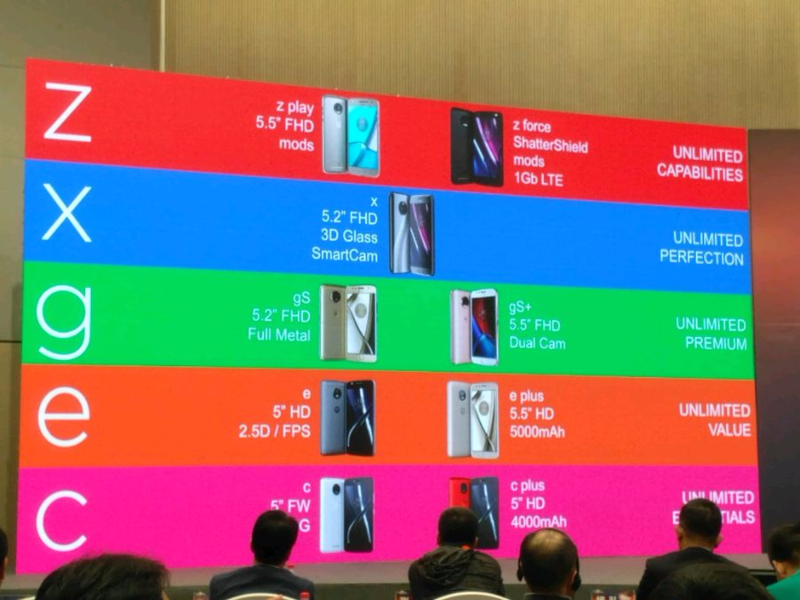 The Moto M isn't there, but I'd assume that's because the M won't be sold in whichever region this presentation was shown at. It should be interesting to see how all these devices work out for Lenovorola.